Saturday April 14th 1894 I was busy all forenoon with my baking and regular work. Will and I went to town in the afternoon. I was over home awhile. Mother gave me some plants. I repotted all I had after I came home and Planted seeds in boxes today. I finished the book I was reading in the evening. I put 10 hours at the piano this week. Sunday April 15th 1894 It was a fine day. We got to church in the morning. I had only got my dinner over when John, Hatt & Robbie came out. They stayed all afternoon and we had a good visit. I read in the evening. Monday April 16th 1894 It was pleasant morning. I was fixing up the part of the hen house to set hens in. Will went to town in the morning to get Will Hedges to help him fix the worn pump. He was here for dinner. Mary Woolf and Jennie were here in the afternoon. There was quite hard shower. Will was planting potatoes. 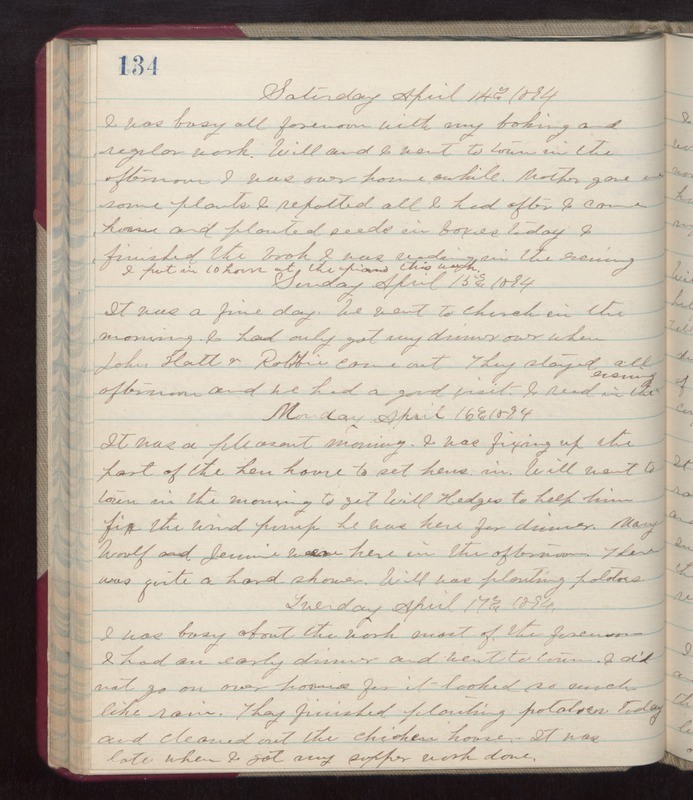 Tuesday April 17th 1894 I was busy about the work most of the forenoon. I had an early dinner and went to town. I did not go on over home for it looked so much like rain. They finished planting potatoes today and cleaned out the chicken house. It was late when I got my supper work done.